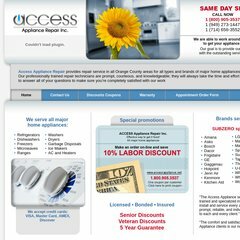 www.Accessappliance.net - ACCESS Appliance Repair Inc. Topics: Discounts Coupons, Warranty, Appointment Order Form, Aliso Viejo, Anaheim, and Balboa. accessappliance.net ACCESS Appliance Repair Inc. It is written for PleskWin language. Its 2 nameservers are ns3.lisbox.com, and ns2.lisbox.com. It is hosted by American Registry For Internet Numbers (Virginia, Chantilly,) using Microsoft-IIS/6 web server.